We are Addicted Art Gallery, so we know all about all-consuming habits. Ours just happens to be art. So when we came across French street artist, THIRSTY BSTRD (aka Julien Surdeau) and his monkey with a fast food addiction we were hooked. So much so that we have collaborated, creating a unique “Fast Food Monkey” print series for our collectors. Some might call it monkey business but we are happier than a happy meal with our new delivery. THIRSTY BSTRD is known for doing what a lot of street artists do, taking cultural stereotypes and turning them on their head. You could argue that anyone with a spray can, and political agenda could create wall art worthy of framing now that street art has become a commodity hotter than a Macca’s apple pie. But what makes us thirst for the works of THIRSTY BSTRD is how he injects them with humour. And while you’re mainlining that good cheer, just be careful, because there are some serious messages at play. “We all know that we shouldn’t feed the animals at the zoo as we stand there staring at them trapped in their cages. We’re not imprisoned like they are, yet we feed our kids and ourselves fast food and all other sorts of junk,” says the man behind the stencil. Touché! So maybe the monkey is a metaphor, even a mirror, showing us what we don’t want to see. Doing damage to ourselves, our families, our friends, our society, is surely the casualty of any addiction. But the paradox is that we’re powerless to see it when we’re in the grip. THIRSTY BSTRD attempts to loosen the vice just enough so we can see the error of our ways. Connecting with the audience is a crucial part of getting his messages out there and forging this relationship depends on the repetition of the art in multiple locations. So, is the prolific nature of his art and our consumption of it not the same as the subject he’s commenting on? The irony is not lost on THIRSTY BSTRD. “Yes you could say that. But to me the most important part of what I do with the designs I create is to propagate, spread them, by pasting, sharing, and making them available on different media, so they can live by themselves, apart from me and make a difference in all sorts of communities,” says THIRSTY BSTRD. Not that you, our audience need convincing…if you’re here you’re probably as addicted to art as we are, but perhaps this is the power of street art and why we keep needing our fix. While amazing art can be relegated to a canvas hanging on a wall in a gallery somewhere where a handful of people will see it (like a monkey in a cage), street art probably has a greater chance of enacting change. 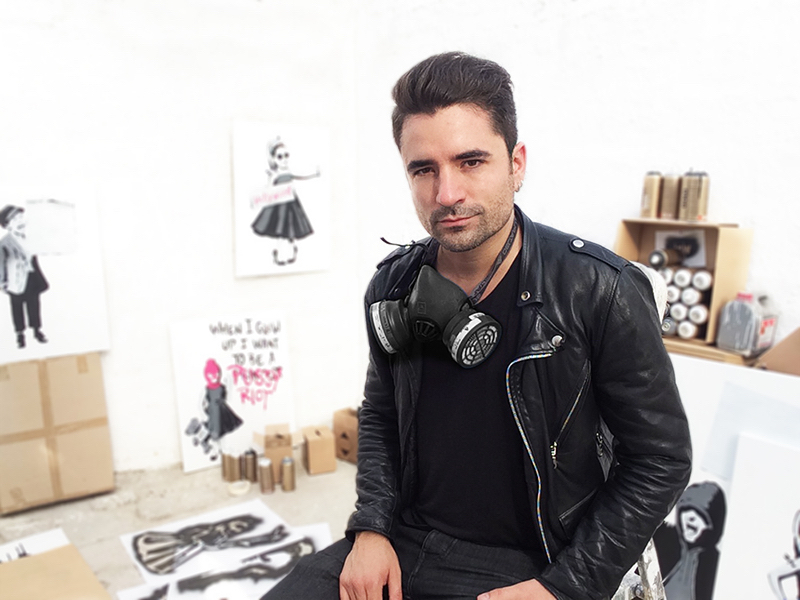 We support artists like THIRSTY BSTRD and applaud their ability to subvert our consumerism to hold up their mirrors and make us look more closely. Just don’t ask us to give up this habit anytime soon. When art is this pure it can get us to higher places. 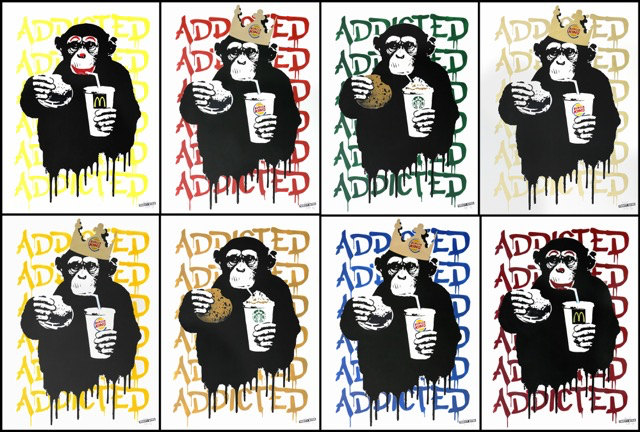 To view the Fast Food Monkey Series by THIRSTY BSTRD, get in touch with Addicted Art Gallery.